A photo by Sigmund J. Osty of the Damen and Division corner on Oct. 9, 1966. WICKER PARK — The Shell gas station at the northeast corner of Division and Damen in Wicker Park will soon be a memory — it's currently surrounded by protective fences with a demolition underway. 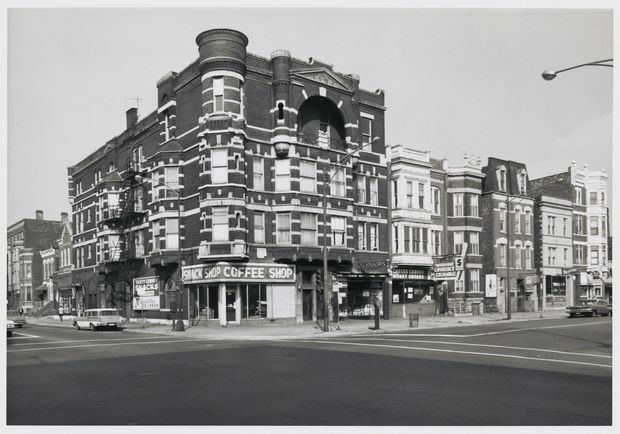 Long before the gas station at 1950 W. Division St., there was a large apartment building at the corner, according to photographer Sigmund J. Osty's black and white photo dated Oct. 9, 1966 provided by the Chicago History Museum. Gaspar Gomez, who operated the gas station from 1977 until its closure Oct. 1, said he thinks the apartment building was demolished in 1970. The site's owners, Rob Buono and Paul Utigard, did not return calls requesting comment about what they are planning to build after demolishing the gas station. Gomez said Buono and Utigard want to build an apartment building anchored by one or more restaurants. Utigard and Buono are prolific real estate developers who've built several apartment buildings anchored by retail and restaurants throughout the city, including an 11-story, 99-unit tower just up the street from the gas station at 1611 W. Division St.
Jon Gorske, co-owner of Velvet Goldmine, a vintage home furnishings shop across from the gas station, owns a copy of the Osty photo. Gorske said that bringing apartments and restaurants to the gas station site would return it to something similar to what it had been several decades ago. A billboard on the side of the long-gone building advertised "tasty corner snacks" by Nonebetter, a Chicago-based candy company. DNAinfo was unable to find any information on the building's demolition, but for a peek into that era, a Nov. 7, 1971 Tribune story by Robert Cross headlined "Proud Old Stubborn Wicker Park," talks about "a couple of big gas stations" at Damen and Division, which means that the station would have existed by 1971. Cross' piece focused on whether or not Wicker Park was turning into a slum and a smaller headline asked, "Is it too late to put a once-grand neighborhood back together again?" "Slums do not happen overnight much anymore. Instead, certain neighborhoods take the city's backwash for decades, slowly eroding, slowly awakening to the discomfort the erosion brings, feeling helpless as they see the good life slip away," Cross wrote in the opening sentence to the nine-page feature story. The neighborhood had "a drug problem" and "Nelson Algren, a somewhat reclusive neighbor, had written about it," Cross wrote. "The "scene" at Damen and Division had recently given way to a couple of big gas stations. When a newspaper noted that major drug activity had shifted northwest to the corner of Western and Potomac, a police official complained, "Why not just put a sign on the Kennedy Expressway: "'Get Your Drugs Here'?" Cross writes.